My parents, Johannes and Elfriede Hoeber, were fortunate in escaping Nazi Germany. The story of how they got out in 1938-1939 is the subject of the book Against Time: Letters from Nazi Germany, 1938-1939 to be published next year. Not all of their friends were as fortunate as they. When I was working on the book, I found a letter among my parents’ papers that told the astonishing story of a close friend of theirs. The letter was written to my father in 1960, during the time when Adolf Eichmann was on trial in Jerusalem. 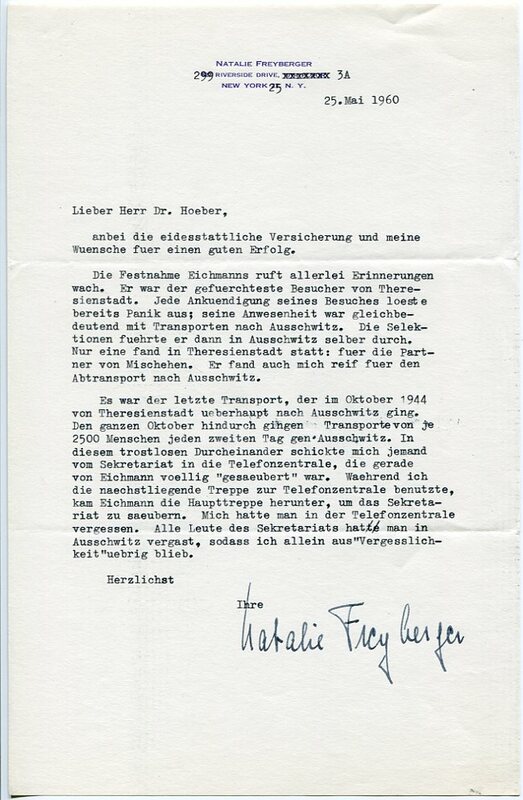 Letter from Natalie Freyberger to Johannes U. Hoeber, May 25, 1960. Eichmann’s arrest has aroused all sorts of memories. He was the most feared visitor to Theresienstadt. Every time there was an announcement of his visit it set off a panic; his presence meant the same thing as transports to Auschwitz. He then carried out the selections himself in Auschwitz. Only one of them took place in Theresienstadt: for the spouses of mixed marriages. He found me suitable for removal to Auschwitz too.